Please note that there have been several new developments to the Draft Local Plan being presented on Monday evening. It would be good if we could have as many people attending as possible as it is important that we continue to express our opposition to unsuitable over development. Monday 12th JUNE, 6 pm. We are holding a GARDEN TEA PARTY on Wednesday 14th JUNE from 3 – 4.30 pm, at 6 Kenston Court (off High Street). Monday 12 June 6pm, Colchester Town Hall. Colchester Borough Council to present the Borough Plan. Colchester Borough Council have postponed the scheduled Local Plan Meeting to Monday 12 June 2017 at 6 pm at Colchester Town Hall. Anyone wishing to speak briefly at the meeting should be there by 5.30 pm in order to give their name to the Clerk of the Committee. Apparently Colchester Borough Council do not wish to discuss the proposed Local Plan during the run up to the General Election. We need as many people as possible to attend to show continued interest in our future development. Now that Middlewick Ranges are to be included (which was not the case in the original draft) there is a danger that Mersea’s objections to overdevelopment on the Island will be overlooked. Also, future congestion and overloading of the Mersea road needs to be considered in the light of Middlewick Ranges. The public are entitled to speak so if you want to do so please be there by 5.30pm to give your name in to the clerk of the meeting. Any queries, please call Sarah on 383326. Further to the post setting out the Society’s submission on the proposed housing development, here is a link to some other submissions on the subject to Colchester Borough Council which are likely to be of interest to readers of this website. 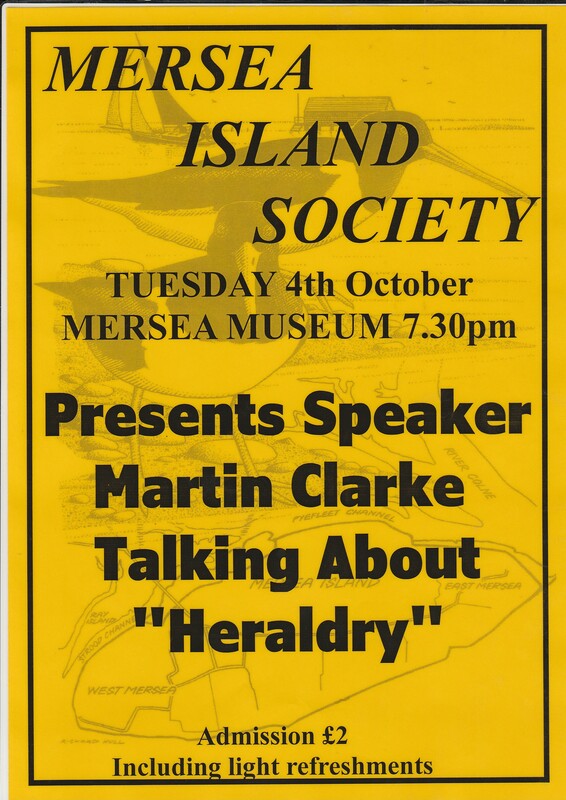 The first of the Society’s autumn lectures will take place at Mersea Museum on Tuesday 4th October 2016, starting at 7.30 p.m. when Martin Clarke will be talking about heraldry. All are welcome (members and non-members alike): the admission fee is £2 and light refreshments will be provided. The AGM and a talk by Sue Howlett on Mersea in Tudor Times will follow on Tuesday 1st November. 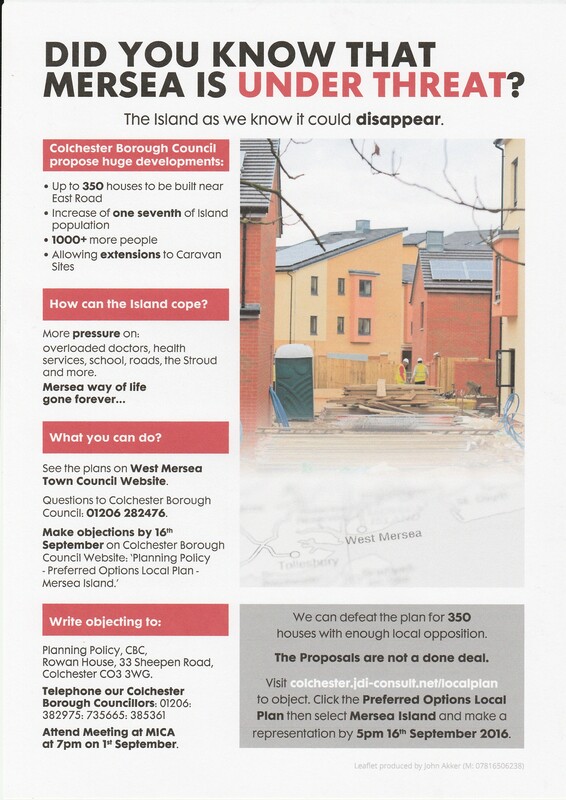 I am submitting these comments on behalf of the Mersea Island Society which represents a membership of 500 residents. However figures obtained recently from Colchester BC tax department show that the actual number of dwellings at 3580 is already in excess of the proposed sustainable levels. This confirms the planned capacity has been reached already and that there are insufficient services and infrastructure available to support additional housing, equating at reasonable estimate to 1000 residents and 500 cars. General observation and experience on the Island makes this evident anyway. Committee member Marica Frost is organising an Open Garden Coffee Morning on Thursday 8 September to raise funds for MacMillan Cancer Trust. The event will take place between 10 a.m. and 1 p.m. at 3 Oakwood Gardens West Mersea, and will include Bring and Buy and a Raffle. Entrance (inclusive of a homemade scone and a drink) is £2.50. All are welcome. Download the poster from here and display it. View the plans on the West Mersea Town Council website here. Attend the meeting at the MICA to discuss the proposed development which has now been rescheduled for 7 p.m. on 1st September. Make representations online here by 5 p.m. on 16th September. Write objecting to Planning Policy, CBC. Telephone our Colchester Borough Councillors.